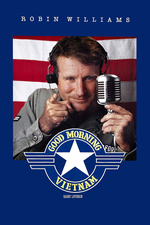 What is inspired about “Good Morning, Vietnam,” which contains far and away the best work Williams has ever done in a movie, is that his own tactics are turned against him. The director, Barry Levinson, has created a character who is a stand-up comic - he’s a fast-talking disc jockey on Armed Forces Radio during the Vietnam War, directing a nonstop monologue at the microphone. There is absolutely no biographical information about this character. We don’t know where he comes from, what he did before the war, whether he has ever been married, what his dreams are, what he’s afraid of. Everything in his world is reduced to material for his program. Levinson used Mitch Markowitz’s script as a starting point for a lot of Williams’ monologues, and then let the comedian improvise. Then he put together the best parts of many different takes to create sequences that are undeniably dazzling and funny. Williams is a virtuoso. But while he’s assaulting the microphone, Levinson is doing something fairly subtle in the movie around him. He has populated “Good Morning, Vietnam” with a lot of character actors who are fairly complicated types, recognizably human, and with the aid of the script they set a trap for Williams. His character is edged into a corner where he must have human emotions, or die. Actor Bruno Kirby (playing 'Lt. Steven Hauk') was in This Is Spinal Tap (1984), Tin Men (1987), When Harry Met Sally (1989), and a whole lot more. You may recognize actor Robert Wuhl (who plays 'Marty Lee Dreiwitz') – he has appeared in Flashdance (1983), Bull Durham (1988), and Batman (1989), among other projects. Character actor Richard Edson ('Pvt. Abersold') was in the cult movie Stranger Than Paradise (1983). Noble Willingham ('Gen. Taylor') has an impressive resume with over 30 feature films and lots of TV – so you may recognize him, too. The song, "What a Wonderful World", sung by Louie Armstrong, is famously used ironically in this film. BBC News article: "How Political is What a Wonderful World?" "Time to rock it from the Delta to the DMZ!" "The wrong man. In the wrong place. At the right time." "In 1965, military D.J. Adrian Cronauer was sent to Vietnam to build morale. His strategy: keep 'em laughing. His problem: staying out of trouble." Adrian Cronauer spoke to vets a few years ago about the accuracy of the portrayal, with some remarkably prophetic insight into Williams. I see him implying he gets some sort of residuals from the film's continued popularity but he doesn't seem to have e.g. a story credit. Another notable cast member is J.T. Walsh as Sgt. Dickerson, one of the original That Guy From That Thing/Hey It's That Guy character actors, who died of a heart attack aged 54. One of his last films was Pleasantville. It's a great film that never fails to come to mind when I hear someone trying to start a car that's already running.